Home›Gear›GEAR SHORTS: What's included in a $99k PXG Xperience? GEAR SHORTS: What's included in a $99k PXG Xperience? How does a private jet, two custom fitted sets of PXG clubs and a round of golf with the billionaire founder of the Arizona brand sound? Well, that's exactly what PXG is offering in what might just be the best fitting experience we've ever seen. Described as an ‘elite four-day getaway for two’, it includes extensive club fittings, two sets of 14 clubs, golf, luxurious accommodation and the small matter of breakfast and a round of golf with PXG founder Bob Parsons. Here's the package in full. Its description reads as follows and can be yours for the princely sum of $99,000. "The Ultimate PXG Xperience is one you'll share with the legacy himself - PXG founder Bob Parsons. The elite four-day getaway for two includes club fittings, two sets of 14 clubs, unparalleled golf and luxurious accommodations in Scottsdale, Arizona. "Private air transportation is provided in a Bombardier Challenger 350 from anywhere in Continental US (international travel also available). Sit down to breakfast with Bob Parsons prior to your outdoor club fitting at Scottsdale National Golf Club, then enjoy your first 18 holes with him on the world-class Mine Shaft Course." Last week, we told you about Ralph Lauren’s USA teamwear reveal and Galvin Green’s official European weatherwear launch. Now, Callaway and the Bryan Bros have taken USA support to a whole new level. Callaway’s wedge customisation specialist Anthony Taranto (@TarantoAnthony) is forever posting images of his awesome designs online. These ones, though, set the bar even higher. Surely they’re just for show, right? Apparently not. Trick shot specialist and new Web.com Tour graduate Wes Bryan appeared to claim ownership. As Tiger Woods' go-to man for putting tips, it's safe to say Steve Stricker knows a thing or two about how to play well on the greens. It appears, however, his wife Nicki might know even better. Who told Steve Stricker to change putters? Stricker revealed last week ahead of the Deutsche Bank Championship that Nicki was the one who advised him to move away from his heel-shafted Odyssey White Hot #2 to 'something a little bit easier'. He was spotted using a new Odyssey Works Versa #7 during the event. 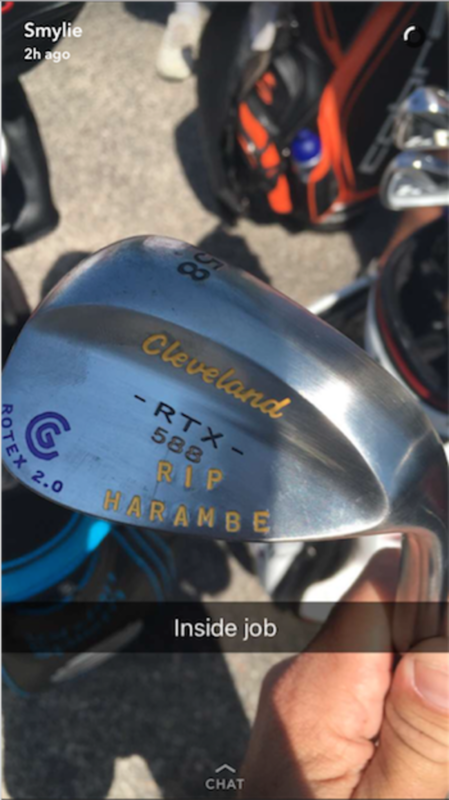 Smylie Kaufman grabbed our attention when he showed off his new wedge stampings on Snapchat last week. Apparently, Kaufman’s wedge relates to a popular conspiracy theory suggesting that Harambe, the Cincinnati Zoo gorilla that was put down after a child fell into its enclosure, passed away due to an ‘inside job’. Ever look at your old clubs in the garage and wish you could get them back in playing order? Well, avid golfer Ryan Barath has done exactly that. First released back in 1994, these irons were known for their high quality forging and playability. They are also renowned as the irons Tiger Woods used to win his first green jacket in the 1997 Masters.